Tonight I needed a quick supper as I was in the middle of more than one sewing project and I wanted to keep working on them. This is what I whipped up for dinner, tossed with some pasta and though it only took minutes, it was so YUMMY! I have learned that anything sauteed in olive oil and garlic ends up tasting delicious. So, that's what I did! I threw some chopped garlic into olive oil. 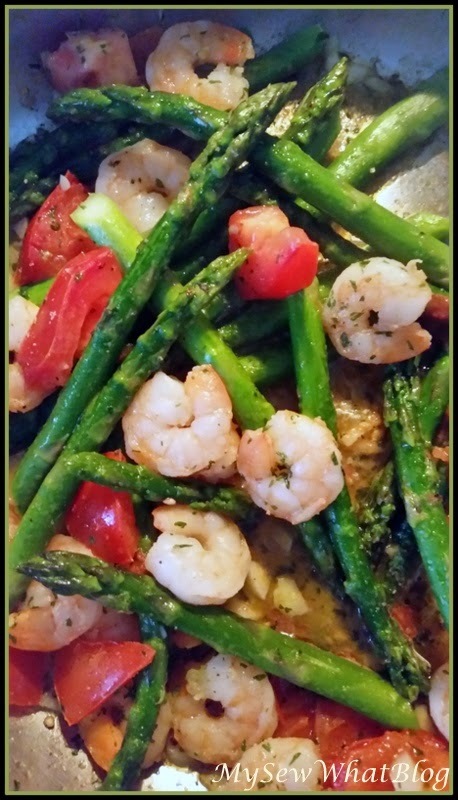 Then I added jumbo shrimp and fresh asparagus. When the asparagus was partially cooked (I like my veggies tender-crisp) I added some fresh chopped tomato, parsley black pepper. It smelled so good while it was cooking!!! Once it was cooked, I served up some pasta and topped it with the shrimp and veggies. We enjoyed it! 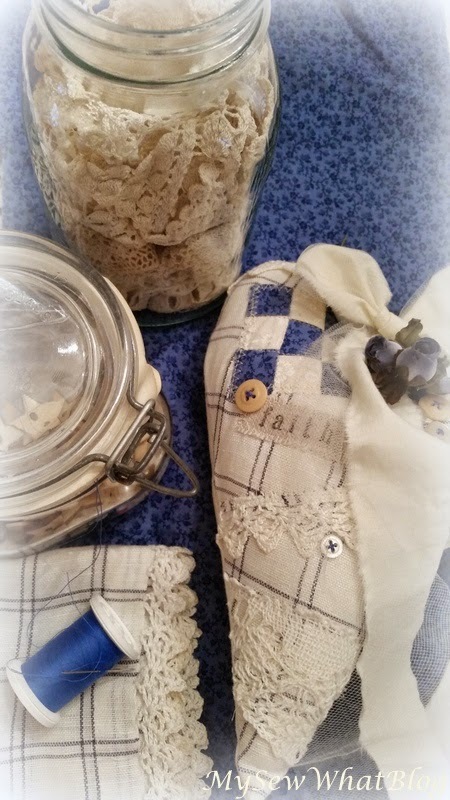 Then as soon as I cleaned up the kitchen I went back to my sewing. 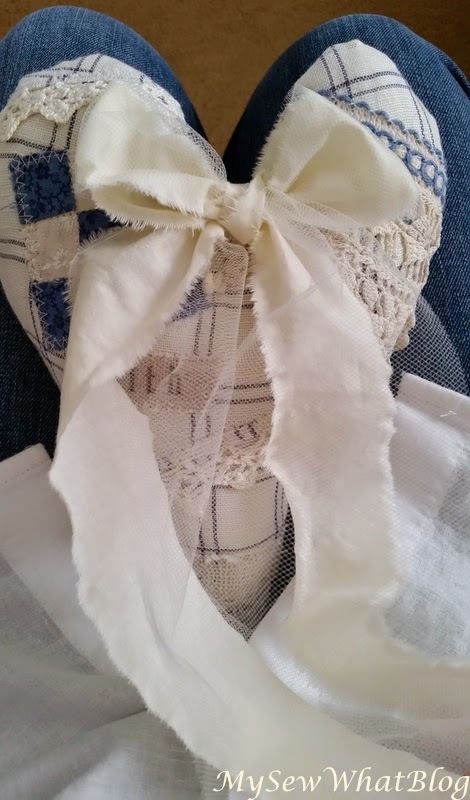 I finally found the nerve to cut into some linen to create one of my vintage inspired heart pillows. 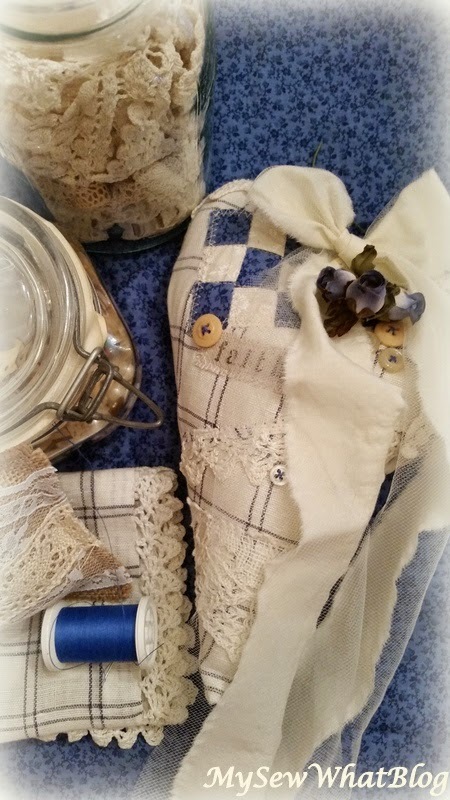 I used the blue and ivory linen placemat that you see in the photo above. 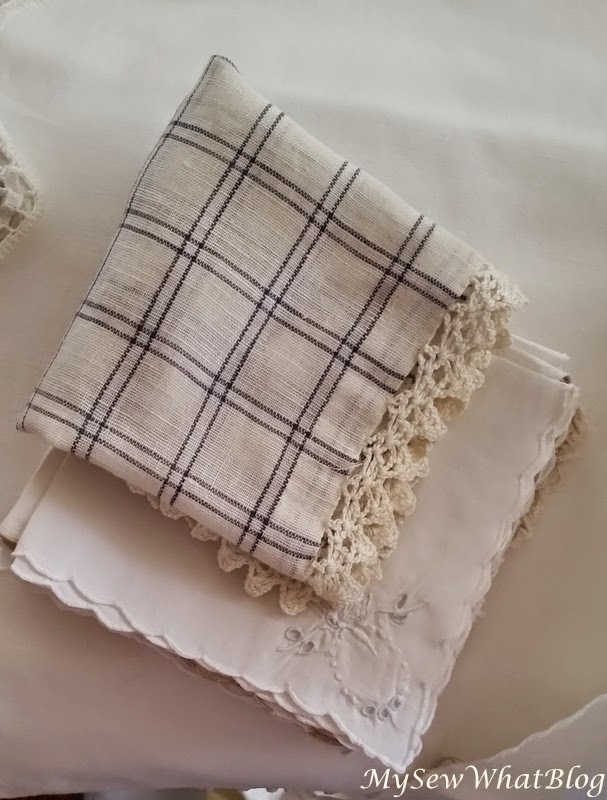 I decided it was okay to cut up because there were some tiny stains and tears in the linen that could easily be worked around. 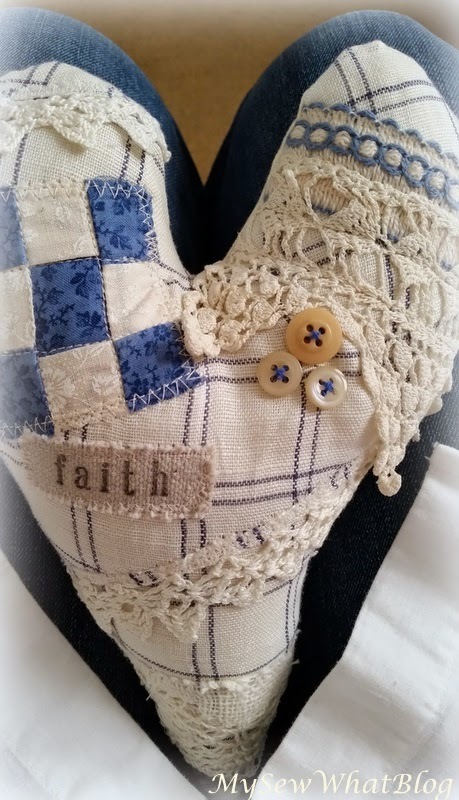 I was very pleased with the fruits of my labor and I do believe this is my new favorite of the little vintage pillows I have sewn. It is very sweet! 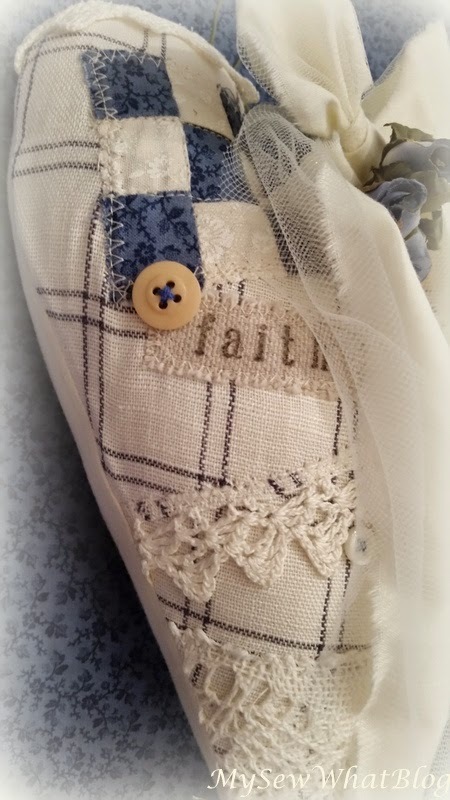 I stitched the little quilt patch and the various vintage laces onto the heart, stamped the sentiment onto some painter's canvas and stitched, sewed the front and back(which is an ivory muslin) together and turned right side out. Then I stuffed the pillow. It was coming together nicely. Next I tore the strips for the bow. At this point I took my heart pillow into the living room to sew on some buttons. I turned on the TV to watch some news while I was sewing. The blue you see in the photo above and below is actually my knees and I am wearing blue jeans. My jeans frame the heart pillow rather nicely! I still have enough of the placemat to make another pillow and so I shall......but right now I have to finish a custom cherub before I turn in for the night. 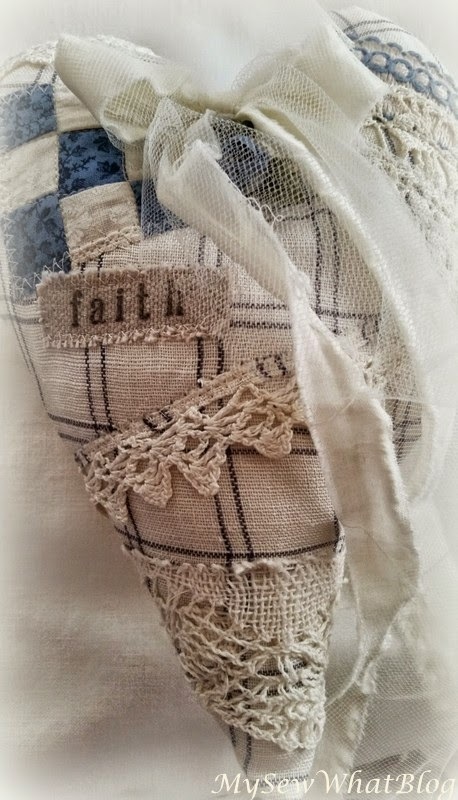 She will be wearing a white eyelet dress and I look forward to embellishing her.